Cianna Medical, Inc., a provider of wire-free breast localization, has received 510(k) clearance from the U.S. Food and Drug Administration (FDA) to extend the indication of its SCOUT reflector for use in localization of soft tissue. The SCOUT System has been in use for wire-free breast tumor localization since 2016 and has been proven in over 42,000 procedures in more than 325 medical centers in the U.S. SCOUT is uniquely suited for marking tumors, biopsy sites and lymph nodes prior to neoadjuvant therapy. Because the SCOUT reflector does not have a clinically significant MRI artifact, it does not interfere with MRI studies; there is no restriction on the imaging modalities that can be used effectively throughout a patient’s treatment. Physicians are using SCOUT as a solution for breast tumor localization, bracketing of large or diffuse breast lesions, targeted lymph node dissection, placement at the time of biopsy and to mark tissue prior to neoadjuvant chemotherapy. With seven peer-reviewed publications and over 20 clinical abstracts, the SCOUT system has been proven to be easy to use and provides accurate detection and precise localization. SCOUT has also been shown to improve radiology work flow and significantly reduce OR delays. SCOUT has received recognition from medical societies and industry associations including the 2016 Scientific Impact Award from the American Society of Breast Surgeons, the 2017 Gold Award for Medical Design Excellence and the 2018 Premier Breakthrough Technology Award. Beyond the technology, Cianna Medical believes in community education and offering the same standard of care to all patients regardless of their ability to pay. SCOUTCare, an award-winning program that provides assistance for uninsured patients and multi-modality training for radiologists, surgeons and allied health professionals. 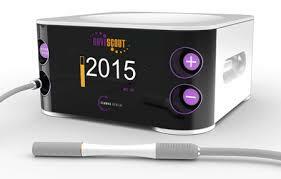 SAVI SCOUT breast localization system indication for use now includes localization of soft tissue. Appl Rad Oncol.